Find below curated tweets by themes. & Big Twitter at The Big Tent, Part 2 for tweets during the first panel with industry and academic leaders. #CTSI2013 : "CTSI's can help bring more of our students together towards the engagement with the Bench to Bedside programs"
& Big Twitter at The Big Tent, Part 3 for tweets during the second panel with UCSF Leadership. The 7th Annual CTSI Retreat focused on a selection of 10 open proposals among 23 offered through The Big Tent: CTSI 2016 NIH Renewal Proposal Launchpad. Attendees and external audiences joined the conversation online via #CTSI2013. A steady flow of tweets came in throughout the day from 27 unique contributors (up from 16 last year) who shared insights, thought-provoking questions and engaged with one another (99,085 impacts!). See Big Twitter at The Big Tent, Part 2 & Big Twitter at The Big Tent, Part 3 for themes that emerged from #CTSI2013 tweets during the two panel sessions. #CTSI2013 has convinced me to finally sign up for twitter! Goal of #CTSI2013 retreat: Generate new ideas for the future! What should CTSI look like in 2016? #CTSI2013 retreat starting strong. Looking forward to the renewal. Rethinking the model of the self-regulating lone scientist. Instead we're fostering connection and accountability #CTSI2013. Continue onto Big Twitter at The Big Tent, Part 2 & Big Twitter at The Big Tent, Part 3. This year’s Clinical and Translational Science Awards (CTSA) communications key function committee (CKFC) Annual Face to Face focused on the critical role of storytelling to lift research of out its silos to a wider audience. Ready for the latest news from @ncats_nih_gov and #CTSA at the #CKFC2013 in Albuquerque! Five questions with UCSF neurologist and stroke researcher Anthony Kim about his new study on how the Internet can help to connect with people who are searching for information online and potentially reduce incidences of preventable diseases. 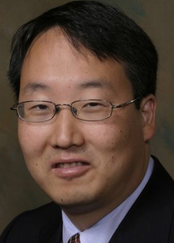 Anthony S. Kim, MD, MAS is assistant clinical professor of neurology at the University of California, San Francisco (UCSF) and Medical Director of the UCSF Stroke Center. His research focuses on improving the diagnosis and cost-effective management of stroke and transient ischemic attack (TIA, also called “mini-stroke”). 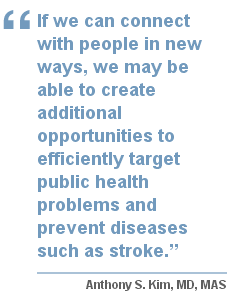 An estimated 800,000 new strokes occur each year in the U.S., making it the fourth leading cause of death in America. Anthony Kim believes that the Internet opens up new opportunities that will change the way we develop interventions and conduct research to improve health. Q: Millions of Americans search online for health information each year. Scientists are using this type of data to better understand flu outbreaks, the seasonal variance of kidney stones, the demographic prevalence of stroke, and even to demonstrate the online effectiveness of health awareness campaigns. What did you learn in your latest study? We were surprised to see that tens of thousands of people were regularly ‘asking’ a search engine about stroke-related symptoms in many cases shortly after the onset of symptoms. In fact, every month, about 100 people were finding our study website by entering the query: “Am I having a stroke?” directly into their Google search box. One of the challenges with mini-stroke is that most people do not seek urgent medical attention because the symptoms are transitory by definition. So people don’t realize that it is a medical emergency. Even though the symptoms may have resolved, the risk of a subsequent stroke is very high—upwards of 11% within the next 90 days—with most of this risk concentrated in the first hours and days after the mini-stroke. So getting the message out there about urgent medical attention is key. We started this study because we thought that if people who have had a mini-stroke are looking online for information on their symptoms, then rather than just listing static health information about the disease on a website, maybe we can engage them by making the website more interactive and asking them to enter some of their symptoms online. And we wondered whether we could use this information to assess whether or not it was a true TIA or stroke and then encourage them to get the urgent medical as appropriate. One third of the people we identified hadn’t had a medical evaluation for mini-stroke yet, which is critical, because it is a medical emergency. Instead of calling a doctor or going to the emergency room, many people were turning to the Internet as the first source for health information. Q: How did your approach work exactly? 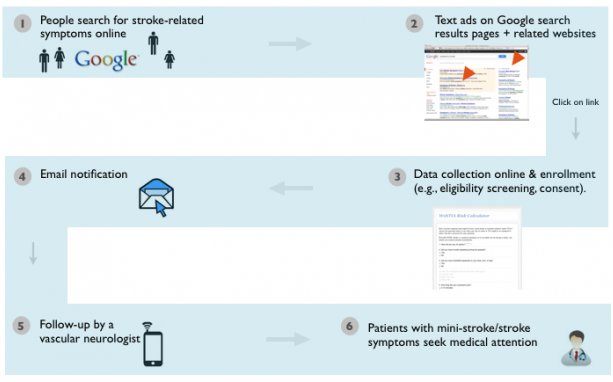 When a person searched on Google for stroke-related keywords, a paid text advertisement “Possible Mini-Stroke/TIA?” appeared with a link to the study website (Image). The ad appeared on the search results page and on related websites with existing content about the topic. When users clicked on the text ad link, they were directed to the study website. Those visitors who met all of the study’s entry criteria were asked to provide informed consent online. They then reported their demographic information and symptoms based on a risk score developed for use by clinicians. We were notified in real-time as soon as someone enrolled, and then we arranged for two vascular neurologists to follow up with the patient by telephone. Q: You tested the approach for about four months. What’s your verdict? We definitely think that there is a lot of potential here. About 60% of U.S. adults say that their real-life medical decisions have been influenced by information they read online. This changes the way we think about providing medical care and conducting research. With a modest advertising budget, we were able to attract more than 200 people to our study website each day from all 50 states. About one percent of them (251 out of 25,000) completed the online questionnaire, which allowed us to contact them for follow up. Although this seems low at first, it is comparable to conversion rates in other domains of online advertising. Also, even though the people who joined the study were a highly selected group, the incremental costs for reaching an additional person were low and the potential for applying a targeted and cost-effective public health intervention in this group would still be very interesting to evaluate in the future. Before we started, we thought that we might lose people throughout the enrollment process since we confirmed eligibility and asked for consent online, but we didn’t. For the most part, if people were interested in participating, they completed the entire online enrollment process. During follow up calls, we learned that 38% of enrollees actually had a mini-stroke or stroke. But fully a third of them had not seen a doctor yet. Our approach made it possible to connect with these people fairly efficiently and early on in order to influence their behavior acutely. Despite these potential advantages, Internet-based public health interventions that target people who are looking for health information online are still underdeveloped and understudied. There’s a lot for us to learn in this space. Q: What online tools did you use to carry out your project? We used Google AdWords and Google’s Display Network to target English-speaking adults in the U.S. During the four-month enrollment period, the tool automatically displayed our ads more than 4.5 million times based on criteria such as location, demographics, and search terms. Ideally, to minimize ongoing costs you would want to build and optimize a website so that it ranks highly among the non-paid (organic) search results. Non-profits can also take advantage of Google Grants, a program that supports in-kind donations of advertising resources to help selected organizations promote their websites on Google. Q: Do you have any tips for others who want to develop similar projects? We quickly realized that it helped to work closely with our Institutional Review Board (IRB) given that this is a new and evolving area of research, and to ensure data security and safety mechanisms are in place to protect participants. I definitely recommend that. It’s also important to be realistic about the goals and metrics of success, and not to over-interpret numbers that seem to reflect low engagement. We saw that most visitors (86%) immediately exited the website within a few seconds of arriving at the home page. This probably reflected people who were looking for something else and clicked away immediately. But the beauty of the Internet is that it is very efficient to reach people across a wide geographic area very quickly. So it is not unexpected that we would also screen visitors who may not be qualified for the study or are not interested in enrolling. Groups interested in using this approach should think about selection bias, authentication, validation, and the “digital divide”. Even though there is some evidence that disparities in access and adoption of Internet technologies are narrowing in the U.S., depending on the goals and target for your study or intervention the reach of the Internet is not uniform. But selection bias issues aside, for a public health intervention you may be most interested in other metrics such as the number of people reached per dollar spent, or the burden of disease averted per dollar spent, which the Internet is particularly suited to help optimize. And, it’s definitely beneficial to bring different subject matter and methods experts to the table. Knowledge of search engine optimization, online accessibility, website and user interface design is not necessarily part of the core expertise of a traditional clinical researcher, but developing these skills and interacting with experts in these areas could become very important for the new cadre of clinical researchers and public health professionals coming down the pipeline. …and how the business sector can tap into this emerging market. Eric Meeks has worked for numerous startups in Silicon Valley including Ning, one of the first social network systems to support OpenSocial. Since 2009, he has been the lead technical architect for the Clinical & Translational Science Institute (CTSI) at the University of California, San Francisco (UCSF), the first academic biomedical institution using OpenSocial in an open source research networking product. He is also a founder of the Open Research Network Gadgets (ORNG). Q: OpenSocial is built upon the idea that ‘the web is better when it’s social’. It encourages developers to build standardized web applications that can be shared across different social networking platforms. 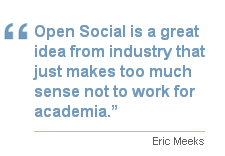 How can academia and biomedical research benefit from OpenSocial? If you look at the topography of all the different research institutions, many of them run different back-end systems, from Windows to Linux, Oracle to MySQL to SQL Server, and all with custom data models. Despite differences in our underlying systems, however, we’re becoming very common in that we deploy research networking systems to help investigators find and connect with one another. Some systems are based on Profiles, some on VIVO, some are custom like LOKI, CAP, or Digital Vita. As much as we want to share new features and applications to extend these systems, it’s really difficult to do that because the applications are hard-coded and tailored to our specific institutional databases. As a consequence, many applications are rebuilt for the various systems. OpenSocial allows us to change that. By agreeing upon a solution that is standardized by a large community, we can agree upon a way for sharing these things. We can build one version, share it amongst everybody, and be more cost-effective. In other words, implementing OpenSocial makes applications interoperable with any social network system that supports them. Academic research institutions can use OpenSocial to open up their websites so that multiple people can add new features and applications and they can all do it at the same time, and independently of one another. ‘A platform beats an application every time,’ as O’Reilly Media put it. I see that as extremely powerful. It’s the only way I see to solve the problem that we have with different institutions deploying different research networking tools. Q: What are some of the ways that the social web and OpenSocial are relevant to academia? In research as in in other areas of life, communication and collaboration are supported by relationships. At their core, research networking systems are similar to social networking systems like Facebook, LinkedIn or Ning. They are showing a researcher’s expertise and how researchers are connected to each other. The difference is that the social ‘friend’ in an academic network is embellished with different attributes such as co-authorship, mentorship, and shared areas of research. Research networking systems were created to leverage and enhance these academic relationships. Q: You lead the OpenSocial efforts at UCSF’s Clinical and Translational Science Institute. How would you describe your work to improve research networking? We’re working with researchers and administrators to identify needs for applications that are appropriate for research networking tools. The gadgets that we have developed are intended to fill some of the gaps that exist. They allow individuals to update their research profile by adding presentations hosted at SlideShare, data that indicates an interest in mentoring, and relevant web links. Gadgets also make it easy to export publications in different formats from any profile, and help users build lists of people based on common attributes like research interests. And finally, a more generic Google Search gadget broadens the existing Profiles search to include free-text fields like the profile narrative and awards. All of these applications are available to any institution that wants to utilize them. (See the full gadget library.) It is our hope that our library of free gadgets will grow as more institutions join the OpenSocial community. Right now, we’re in the process of building the community, which also means that the first members of this community don’t really get to benefit from it, but that’s changing. Wake Forest University, for example, has adopted OpenSocial and is using one of our applications. But they also built their own applications and made them available for free. Andy Bowline, Programmer at Wake Forest University, created a gadget that matches NIH reporter grant data with researchers’ profiles to identify grants that may be appropriate for a researcher to look into. Andy reached out to the NIH OER Grant Search team and got permission to scrape their website on a daily basis. The gadget grabs the data and throws them into a search engine. It also talks to the web service that Andy built on top of that to find matching grants. Andy not only shared the gadget that does this, but they also allow us to use their web services. That’s exactly what we want to see. We’re not competing. On the contrary, we’re trying to do the same thing. By using OpenSocial we can do it together. Most excitingly, our OpenSocial code is becoming an official part of both the Profiles and the VIVO products. We have been working with both developer teams of both products supporting OpenSocial in our development environment. It’s great to see the same gadgets running in both of these two different systems, especially when you consider that the technology stacks between the two products couldn’t be more different. Profiles runs on Microsoft technologies while VIVO runs on Java. However, since they are both supporting OpenSocial, those differences don’t matter; the gadgets run in either environment without alteration. Q: What tips do you have for academic institutions interested in adopting OpenSocial? There are a few things. I think it is helpful to have internal discussions with your development team and web strategy leaders to discuss how existing applications could be repurposed in a research networking site. Not all applications are suited for this type of deployment of course, but for some it may be the best way to make sure that these applications are seen and used. OpenSocial is a huge API. I recommend integrating with Apache Shindig, which is the reference standard for OpenSocial. It shows you in ‘living code’ what an OpenSocial website should do and it also serves as a library to make your website OpenSocial compliant. LinkedIn, Google, Nature Networks and others are using it. I also recommend taking advantage of the applications we already developed to help save time and money. We’re giving out both the applications and the code we use to convert our website to be OpenSocial-enabled, which lowers the technical bar quite a bit. It’s easy to apply the code in a few days. Another important lesson that we learned is the need to prepare for managing expectations and overcoming political hurdles. OpenSocial is extremely powerful, but as with any technology, it doesn’t do everything and it does require some amount of technical investment. It is also helpful for interested groups to know that we have combined OpenSocial with the Resource Definition Framework (RDF) standard that is core to VIVO and can now also be found in Profiles and LOKI. RDF is a component of the semantic web and Linked Open Data. When applications support RDF it is much easier for them to share data. As a matter of fact, the CTSA network recommends that institutions use VIVO compatible RDF within their research networking tools so that all of our data can be accessed more easily. With OpenSocial, we are able to use VIVO RDF to expose much richer data to our gadgets than the OpenSocial specification originally allowed. This is a great win and allows us to build gadgets that are very specific to our biomedical researcher needs without having to sacrifice interoperability. Q: Originally, OpenSocial was designed by corporations such as Google and MySpace Google for social network applications. While OpenSocial is seeing wider adoption in enterprise companies, that adoptions has been slower in the academic biomedical arena. What would you like to see from the business sector? I would like for industry to recognize that there is an emerging market here that they can tap into. It’s a market that has a lot of value, a lot of social benefit, and a lot of wonderful brands behind it such as UCSF, Harvard, and Cornell. This is the kind of work that industry should be proud to be a part of, and they can convert that into a marketing message. I also want industry to know that we would like to work with them. What we don’t want is for OpenSocial to drift off into some area where it’s dominated by the entertainment or finance industry and no longer viable to science and academia. The OpenSocial Foundation is a main driver in this respect, and they are eager for adoption by people and institutions working in the health sciences. The Open Social Foundation is much more targeted at collaboration and productivity as opposed to entertainment. Q: What’s your vision for OpenSocial at UCSF and for academia in general? A standard only has value when it has adoption across multiple platforms, so we want to promote it and build a community. We also want to be a part of that community to be able to share the benefits of the networking effect. Right now research networking systems only give us a hint of what they’re capable of doing. People today are using these platforms to find out about one another, and even this is happening in a limited sense. People should be using these platforms not just to find out about one another, but to interact and get things done. That’s what people are doing with LinkedIn, Facebook, etc. With a strong OpenSocial community we can advance and extend current research networking systems much faster and cheaper to give researchers and administrators the opportunity to be hyper-connected and hopefully more productive. This Q&A is part of “Digital Media & Science: A Perspectives Series from CTSI at UCSF” moderated by Katja Reuter, PhD, associate director of communications for CTSI. This series explores how digital media and communications can be used to advance science and support academia.